It's been a little while since my last wish list but with summer approaching pretty fast and my brand new layout I thought now would be a good time to get them started again since theres so many pieces that I've fallen in love with recently! I have been on the hunt for bikinis so thats what my next one is going to be about but this time around its shoe themed and all of these can be found on LYST which is a site that brings designer items together so you can shop for them all at once! Pretty cool. 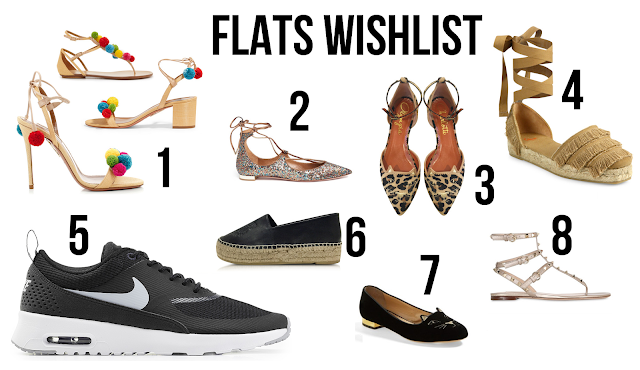 So I know this is supposed to be a flats wishlist but I'm kicking it off with a pair of heels (1). I did actually come across the flats first but they are so super cute that I had to include the mid and high heeled version too! I already have a pair from ASOS that are very similar but I just love these and all their cute little pom poms! Moving on to something a little less fluffy but just a cute - these sparkly lace up flats (2). I love in my plain black ones in the summer but this just adds something a little different. They'd be perfect around Christmas time! More cuteless on the scene comes from these Charlotte Olympia kitty flats (7). I know they are a little bit old news now but that doesn't stop them being super cute! I love the simple black and gold but I didn't realise they came in so many shades! My favourite pair from LYST's collection has to be these leopard ones (3). This summer, I'm all about the espadrilles and although I haven't come across and high street versions that I like yet, I instantly fell in love with both of these! I love the super thick sole, black leather Kenzo espadrilles (6) which have the brand tiger embossed on the front and these beige, lace up the leg versions from castaner (4). As for trainers, I live in my black and white roshes so I am really ready for another style when it comes to every day black and white trainers (5). I cant do with trainers that look to exercisey so these will do perfectly! and lastly, I know everyone loves the Valentino heels but I think these these flats (8) versions are actually much nicer! What do you think?